This article is about the current situation of health in Ukraine. The crumbling poorly financed healthcare system and rumours that children have fallen ill or even died after being immunised have led to a very poor vaccination rate. In August 2016, 30% of children in Ukraine were fully immunized against measles, 10%, against hepatitis B, and 3% of against diphtheria, pertussis and tetanus. At the time Ukraine had the lowest routine immunization rate in the world. According to a study, entitled "Main reasons for the high death rate in Ukraine" conducted by the World Bank and released in December 2010 every third Ukrainian aged 18–65, including every fifth aged 18–25, had a high blood pressure. Almost 29% of the respondents suffered overweight, and 20% suffered from obesity. According to the above-mentioned 2010 World Bank study 36% (28.6% is the average in Europe) of Ukrainians smoke tobacco, including 31% of those who smoke every day. Men with primary education and women with higher education are inclined to smoking. Some 80% of daily smokers are usually men. The average age that daily smokers start the habit is decreasing, and at present is 16 years. In the younger age group there are four times as many smokers as in the older age group. The smallest percentage of smokers is to be found in the west of the country (24.6%), while the largest is in the east (34%). 2.7 million people in Ukraine (6%) were reported as having a disability in 2014. This number did not include the (reportedly) 1.5% of people with temporary disabilities. In 2014, 35% of people aged 60–70 had some age-related disability. For people aged over 80 years, this number grew to 50%. Ukraine is notoriously "disability unfriendly". For example, in the capital Kiev only 4% of infrastructure is considered to be "disability friendly". Ukraine has one of the fastest growing HIV/AIDS epidemics in the world. About 1.63 percent of Ukrainian adults, or about 756,300 citizens, were estimated to be living with HIV/AIDS in 2007, up from 1.46 percent of the population in 2005, or 685,600 citizens, according to UNAIDS. The statistics only reflect official cases, while those infected is likely higher according to UNAIDS. The number of HIV/AIDS cases in Ukraine reduced by 200 or 3.9% to 4,900 in the period of January–November 2008, compared with the corresponding period of last year. Ukraine has one of the highest rates of increase of HIV/AIDS cases in Eastern Europe. Due to its mainly macho, patriarchal culture there is great resistance to psychotherapy in Ukraine. Weak mechanisms for licensing effective counsellors aggravates this resistance. A shame fostered by the years Ukraine was part of the Soviet Union[nb 1] compounds the problem. Soviet authorities rendering psychiatry a tool for punishment (by imprisoning political dissidents in asylums) demonised mental health issues further. Ukraine is considered to be in a demographic crisis due to its high death rate and a low birth rate. The current Ukrainian birth rate is 11 births/1,000 population, and the death rate is 16.3 deaths/1,000 population. A factor contributing to the relatively high death is a high mortality rate among working-age males from preventable causes such as alcohol poisoning and smoking. In 2008, the country's population was one of the fastest declining in the world at -5% growth. The UN warned that Ukraine's population could fall by as much as 10 million by 2050 if trends did not improve. ^ As the Ukrainian SSR Ukraine was part of the Soviet Union since 1920 until Ukraine declared its independence from the Soviet Union on 24 August 1991. 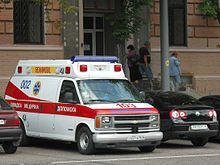 ^ "Ukraine health system in danger of collapse as reforms stall". Reuters. 23 December 2015. Retrieved 5 October 2015. ^ Stern, David (22 September 2015). "Ukraine health officials fear big polio outbreak" – via www.bbc.com. ^ "Why does Ukraine have Europe's lowest vaccination rate?". 12 October 2013 – via www.bbc.com. ^ "Every third Ukrainian has high blood pressure - Dec. 14, 2010". 14 December 2010. ^ "Over one third of people in Ukraine smoke - Dec. 14, 2010". 14 December 2010. ^ "People and Society: Ukraine". CIA World Factbook. Retrieved 18 July 2014. ^ "Ukraine losing HIV/AIDS fight - May. 07, 2008". 7 May 2008. ^ "United Nations Registers More Children With AIDS In Ukraine". Ukrainian News Agency. December 1, 2008. Archived from the original on 2013-01-05. Retrieved 2009-01-25. ^ "What Went Wrong with Foreign Advice in Ukraine?". The World Bank Group. Archived from the original on 2009-07-20. Retrieved 2008-01-16. ^ "Field Listing - Population growth rate". CIA World Factbook. Retrieved 2008-07-05. This page was last edited on 31 December 2018, at 20:38 (UTC).